Beetles, order (Coleoptera) rank as the largest group of insects in terms of species numbers around the world. Because of the large number of species, it’s no surprise that many are found in lawns and gardens across North America. 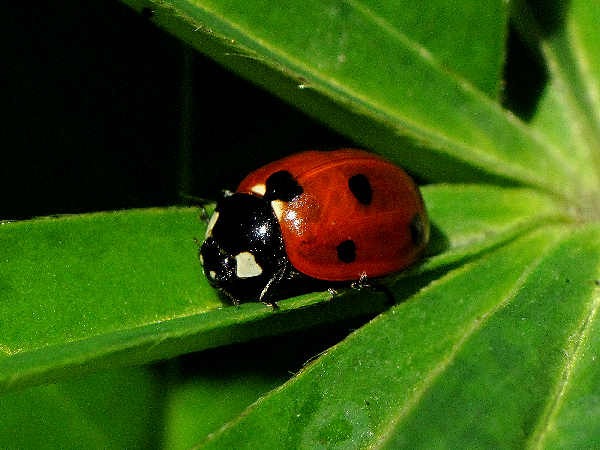 While some beetles can cause severe damage to lawns and gardens, others are considered beneficial insects. Here’s a list of that covers covers both types of common lawn and garden beetles for the purpose of providing identification help. The picture at the top of the page shows the very popular, and very beneficial ladybird beetle. They are beneficial insects that eat aphids. With few exceptions, the approximately one thousand North American long-horned beetle species (Cerambycidae) go about their days without much notice. Like leaf beetles, adults and larvae feed on plant material, including trees, which places them in the category of insect pests. While the presence of many longhorn species in an areas constitutes more of an annoyance rather than a major agricultural or commercial problem, the few noteworthy exceptions continue to interest professionals. The Asian Longhorned Beetle, for example, a non-native species, ranks among the most dangerous of the longhorn beetles. Its larval diet consists of hardwood trees and it does not have any natural predators. Without proper control, an outbreak could easily destroy a hardwood forest. 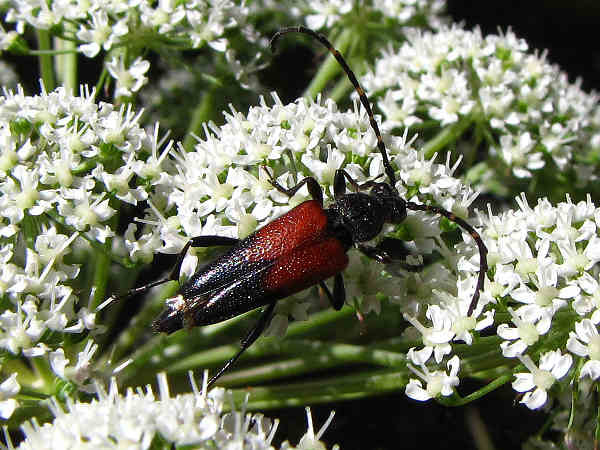 Approximately nine out of ten native longhorn beetles fit into one of three different subfamilies: Cerambycinae, Lepturinae (Flower Longhorns) and Lamiinae (Flat-Faced Longhorns). 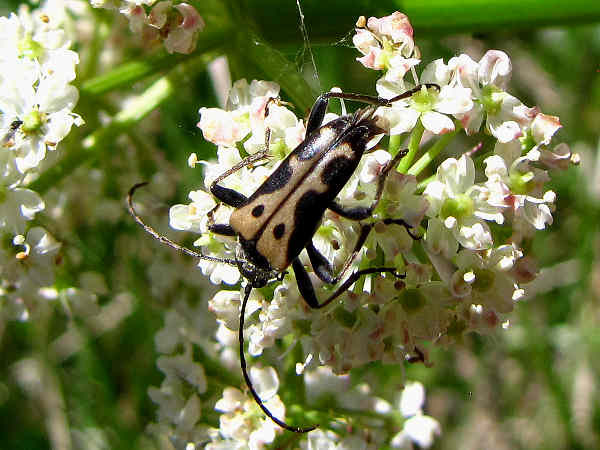 North American texts list approximately two hundred flower longhorn beetle species. The large number of species means that at least a handful of species are potential visitors to any garden. Most present no threat to garden integrity. Interestingly enough, the large number of species also means many lack common names. Flower longhorns in the genus Evodinus, for example, generally do not have common names. Species are common in areas of New England, the Northeast and Pacific Northwest. Evodinus monticola vancouveri is the Pacific Northwest subspecies. The Canadian Flower Longhorn (Stictoleptura canadensis) sports a bi-color (red and black) elytra along with a bi-color set of antennae. A few different subspecies inhabit forested areas of the United States, all probably naturalized citizens. The amount of black and red coloration can change between subspecies, and the Arizona subspecies has red elytra. 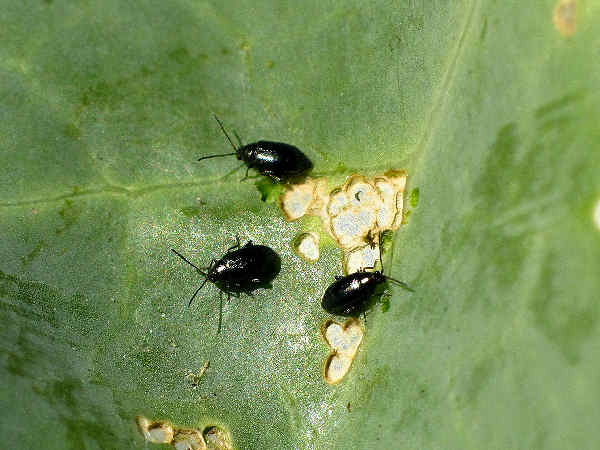 For such a small beetle (less than one-quarter inch in length) flea beetles have a rather poor garden reputation. They can be recognized by their typically dark colored bodies, along with the presence of tiny holes in the leaves when they congregate in large numbers. Different species attach themselves to different plants such as corn, peppers and cole crops. Adults overwinter around garden areas and lay eggs for the next generation during the spring. Keeping the garden area and the grounds around it clean helps disrupt their life cycle. 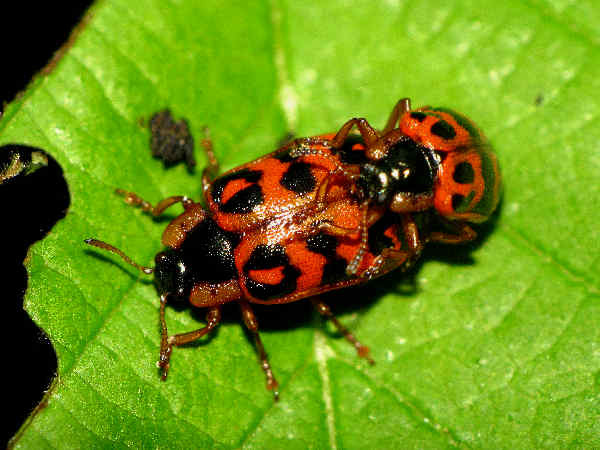 Vegetarians of the beetle world makes leaf beetles (family Chrysomelidae), a must know species for the average home owner. Both adults and larvae consume leaves and other parts of plants in the garden and on trees. 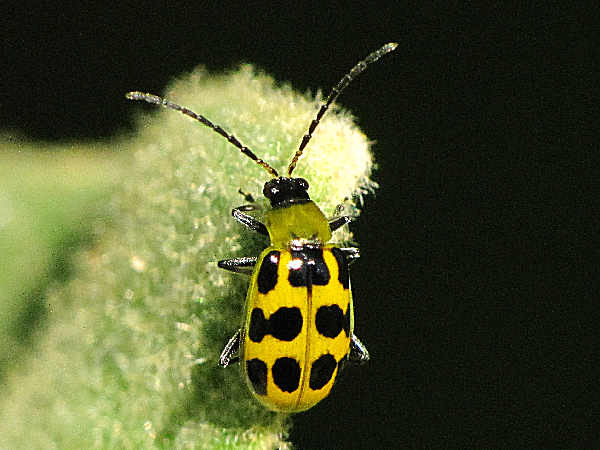 The diet of the Spotted Cucumber Beetle, the very common and colorful yellow beetle in the picture, extends beyond the cucumber family. A quick look around the garden will find them settled on the beans, corn and potatoes along with many young plants. More generally speaking, with approximately fifteen hundred different North American Chrysomelidae species, the pest label can be exaggerated. The majority of the species rarely occur in populations large enough to do significant damage to their host plants. Identify leaf beetles around the yard can be a fairly straight forward task. Usually they share the physical characteristics of having an oval, brightly colored body with antennae smaller than the body. Leaf Beetles in the genus Chrysomela, for example, feed on tree leaves, with different species associated with either a tree species or genus. The American Willow Leaf Beetle (Chrysomela knabi), for example, feeds on willows and related trees. The Cottonwood Leaf Beetle (Chrysomela scripta) consumes leaves from cottonwood, hybrid poplar, and some willow trees. In some cases, Chrysomela can inflict considerable damage to their hosts, especially when the hosts are planted for ornamental reasons. Chrysomela adults measure about one-half inch in length, and they have colorful bodies. The orange bodies Chrysomela in the second picture could be one of a few different species. Often the spot pattern changes form individual to individual and location to location. 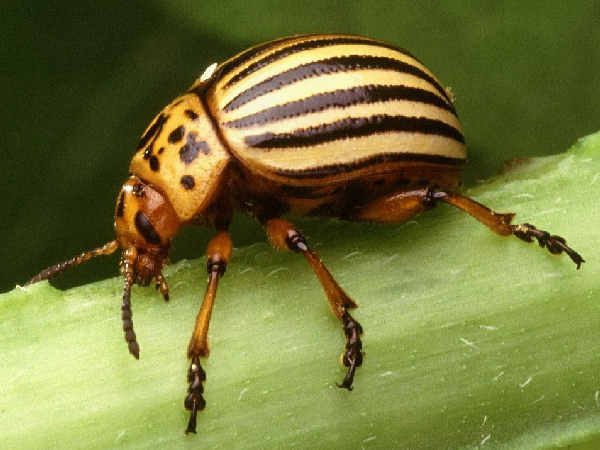 Another very problematic leaf beetle goes by the name Colorado Potato Beetle (Chrysomela decemilneata). 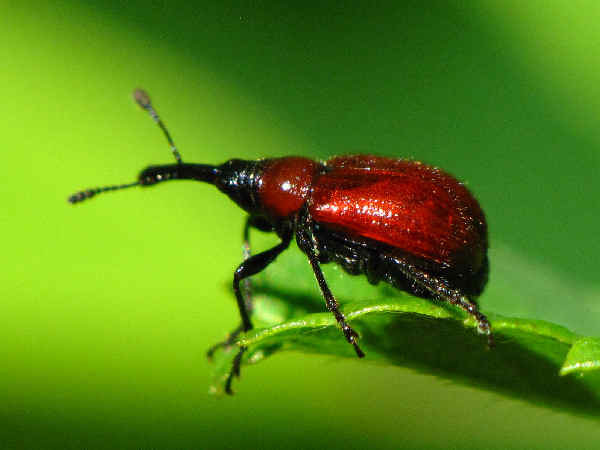 Named for their potato leaf consumption habits, given the opportunity, potato beetles also consume foliage of eggplants, tomatoes and peppers. Keep an eye out for them in gardens across the United States. The bane of many gardeners, the Rose Weevil or the rose curculio (Merhynchites bicolor) is a tiny black and red predator on rose buds. It does not discriminate between wild and domestic roses or between geographical regions. It can literally be found wherever roses grow in Canada and the United States. Organic control of Rose Weevil populations can be straightforward. They are tiny, about one-quarter of an inch in length. However, their bright red bodies stand out against a plant’s green leaves and unopened buds. Prior to the roses coming into bloom, carefully inspect each plant for the insect, and when spotted gently knock it off into a cup of soapy water. Refrain from knocking it onto the ground because it will just climb back up to the buds. 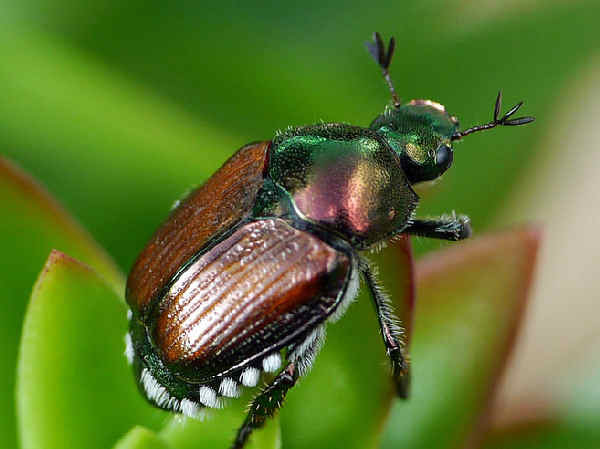 Introduced into the United States in 1916, both adults and larvae Japanese Beetles (Popilla japonica) cause damage to lawns, flowers and shrubs. The green metallic bodies with white tufts provide the basic field ID clues. The grubs overwinter in the soil, and during May and June begin feeding on the grass roots. When the adults emerge they begin feeding on the leaves of most trees, plants, flowers and fruit in the vicinity. Roses are a favorite food. Consumers have a choice of a variety of organic remedies for both grubs and adults, including introducing nematodes to the turf and placing traps around infested areas in order to limit the number of egg laying adults.